JENESIS Magazine and Clique Vodka presents “Who You Wit? Jay-Z Vs. Kanye” – Pittsburgh [2.2.13] – Be Fearless. Be Flagrant. 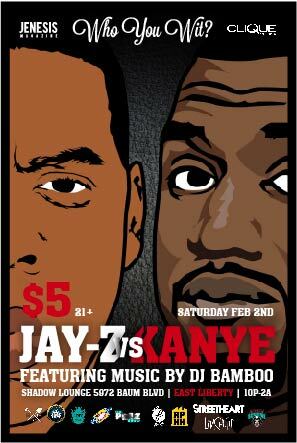 For one of their last events at The Shadow Lounge, that will be closing at the end of March of this year, JENESIS will be bringing back it’s artist appreciation series with a special Jay-Z VS Kanye event February 2nd. DJ Bamboo will be spinning both Jay-Z & Kanye’s greatest hits, singles, remixes, and music from his album as well. Look out for special invites going around. Tweet/Instagram #whoyouwit and pick a side, Jay-Z or Kanye West !